Colombia’s first round of presidential elections on May 27 produced two contrasting candidates for the June 17 runoff – neoconservative Iván Duque and leftist Gustavo Petro – but also highlighted other winners and losers who will shape a new, but still undetermined, political landscape. Winner: Iván Duque, of Centro Democrático, won the most votes (39.14 percent). A total stranger just a couple of months ago, the 42-year-old candidate focused on ensuring benefits for big companies and landowners; criminalization of drug use; restricting LGBTQ rights and blocking gay marriage; and “adjusting” the peace agreement with the FARC to include jail time for former guerrilla leaders. Buoyed by the endorsement of popular former President Álvaro Uribe, Duque represents some of the most conservative interests on the political scene in Colombia, including those who preached against the peace process. Considered an Uribe puppet by detractors, he will probably try to lure some moderate voters to consolidate his victory in the next two weeks. Some of them may think that, just as President Santos was supported by Uribe but moved away from him after being elected, Duque may take an independent path as president too. In the last few days he has been trying to reassure voters he will take care of the poorest of Colombians and will not extend retirement age. Loser: The Liberal and Conservative Parties. Heads of Colombian bipartisanism throughout most of the 20th century, these parties now seem to be empty shells with no trace of their former glory days. The Conservative Party didn’t present a candidate and couldn’t even agree on one to support in the first round. The Liberals ran with Humberto de la Calle – former Minister, Vice President, and head negotiator of the Government with the FARC – who polled fifth (with only 2.06 percent). They’ve entered an alliance with Duque in hopes of ensuring their relevance for the next four years. Winner: Left-centered candidates. Despite the 14-point spread between Duque and his runoff opponent, Gustavo Petro (25.08 percent), the left-leaning parties did very well in view of Sergio Fajardo’s 23.73 percent support – giving them combined almost half of all votes cast. At least half of Colombian voters sent a clear message that they’re tired of traditional politics. Fajardo has already announced he will not vote for Petro, ending speculation of an alliance, but support for both candidates’ strong anti-establishment messages and criticism of “politics as usual” will force a Duque government to listen to them. Loser: Germán Vargas Lleras, former Vice President who has coordinated infrastructure projects for the last three years term and has been ubiquitous at inaugurations, construction projects, and charities – opening him to the accusation of paving his road to the presidency with public funds. He won less than 1.5 million votes (7.28 percent). He has forged an alliance with Duque, but his leverage will be considerably lower than he’d projected. 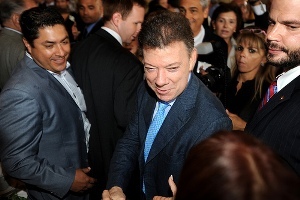 Winner: Juan Manuel Santos. Not even his appalling poll figures will take one signature accomplishment from him: Former FARC guerrillas participated in the election as voters – not as saboteurs – and the image of Rodrigo Londoño (“Timochenko”) casting his vote for the first time will be one for the ages, even with the challenges the peace process has experienced in the last few months. National and international media have called these “the most peaceful elections in the recent history of Colombia,” and not even Uribe and Duque have been able to tarnish this aspect of Santos’s legacy nor the relevance of the accords, changing their promise from “shredding” the document to “modifying” it once in the presidency. Santos says he will leave politics when his term ends in two months, leaving his party and supporters free to ally themselves with whomever they want – even Duque, one of his most consistent critics. If – as at this point appears likely – Duque wins the runoff, his various coalition-building efforts with the Liberal and the Conservative Parties, Cambio Radical (Germán Vargas’s party) and Partido de la U (President Santos’s party) suggest that basic governability won’t be an issue for Duque. He will face new political challenges, however, as votes seem to be shifting from the stable traditional parties and the conservative side of the spectrum to less durable alliances and bureaucratic pacts. Candidates focused on social issues, such as education and redistribution, are opposing these traditional structures. Colombian elites, for their part, will face new challenges and be forced either to accept four years of progressive policies and efforts to reduce corruption and inequality, or keep sinking and pushing the voters away. * Julián Silva is a CLALS Research Fellow, a Ph.D. Candidate in History at Universidad de los Andes, and Professor of International Relations at several Colombian universities. Photo Credit: Government of Venezuela / Public Domain. Despite challenges ahead, the Colombian state’s confrontation with one of the longest active revolutionary groups in the Western Hemisphere appears likely to reach closure by December. As Colombian writer Héctor Abad has said, the peace agreement preliminary signed on August 24 is long, imprecise, often ambiguous, and tedious – certainly not a piece of entertaining literature – but it is the most eagerly awaited, downloaded, shared, and controversial official document in recent Colombian history. The signatures of Colombian President Santos and FARC leader “Timochenko” are still pending, as is the result of a national plebiscite, to be held on October 2. The agreement has already made permanent a cease-fire between the two sides. FARC fighters have begun to gather in the areas in which they will hand in their weapons and await the initiation of transitional justice proceedings. Even if “yes” wins in the upcoming plebiscite – as surveys now predict – this peace by pieces presents challenges. The accord has accomplished more than any Colombian process before and, by many normative international and academic standards, has been better designed and more professionally negotiated than any other Colombian accord. It does not seem, however, to awaken most Colombians’ enthusiasm. A generalized apathy or, in many cases, open disapproval of the negotiations can be linked to the absence of a sense of conflict-related crisis, especially in urban areas, where there has been a steady decline in battle-related casualties for years. In addition, as the World Bank and international media have reported, Colombia’s economic performance has been steadily improving. No longer the Andean problem case, Colombia is now a preferred destination for international investment in Latin America. The “paradox of plenty, Colombian style” – success in promoting security and investment amid conflict resulting – has ended up eroding support of peace negotiations. * Angelika Rettberg is Associate Professor in the Political Science Department, Universidad de los Andes, in Bogotá. Colombia’s Last Day of War? One major hurdle that remains to a final peace accord is the fulfillment of President Santos’s pledge to subject it to a plebiscite. In an interview last week, the president cautioned against any notion that a “no” vote will produce a better deal and instead warned that such an outcome would mean a return to war. Recent polls show that 60 percent of the population says that they’ll vote yes in support of a peace accord, but the Centro Nacional de Consultoría reports that Colombians’ worst fear, which could sink approval, is that one or both sides will fail to meet its commitments. Another poll suggests that 77 percent of Colombians do not want the FARC to participate in politics, a suggestion that Timochenko has rejected. Former President Álvaro Uribe and his Centro Democrático party have led the charge against peace talks under the slogan “Yes to peace but not like this,” and they are unlikely to stop now despite Uribe’s pledge yesterday “not to react to the impulse of first impressions.” Uribe and his supporters have accused Santos in the past of “handing over the country to the FARC,” and 37 percent of Colombians have reported feeling that the government is conceding too much. They are not entirely alone in this estimate, as even generally neutral observers like Human Rights Watch have suggested that the transitional justice provisions – which will provide reduced sentences to those guerrillas who confess their crimes – let the FARC off the hook. The signing of a peace agreement between the two sides is indeed historic, but Santos and Timochencko affixing their signatures to the document is just the beginning of another arduous process. Winning the referendum will require Santos to show vigorous political leadership and enforce greater discipline on his own cabinet team, some of whom have been less than enthusiastic in support of an accord. Even approval in the plebiscite will of course not immediately resolve the many security challenges facing Colombia. Zeid Ra’ad Al Hussein, the UN High Commission for Human Rights in Colombia, has noted that the FARC’s demobilization and disarmament could create a power vacuum in rural areas. Turf wars over coca cultivation, cocaine processing, and the drug trade in which the FARC has been deeply involved since the 1990s are likely to continue, while neo-paramilitaries will likely to fight for a bigger piece of the pie. In addition, government negotiations with the smaller Ejército de Liberación Nacional (ELN) have been slow to start. The international community can help with some of these issues, as it has in supporting the years-long peace process, but the real work will need to be done by Santos and his supporters. Santos’s presidency and the long-term success of any accords rest on his ability to ensure public support, not only now but in the future, as he enters the final years in office. The leadership shown by Colombian President Santos and FARC Commander “Timochenko” – encouraged by the Vatican and the governments of Cuba, Norway, and the United States – will be tested as challenges to completion and implementation of a final accord are certain to be intense. The President and FARC leader announced last week that they’d resolved the thorny issue of justice for guerrilla and government commanders accused of serious crimes and set a deadline of 23 March 2016 to sign a peace agreement. The most important – and controversial – provision covers “transitional justice” for a range of offenses, including crimes against humanity. Most of the estimated 6,000 rank-and-file FARC combatants will get amnesty, while commanders will choose between confessing their crimes and serving five- to eight-year terms performing labor in institutions other than prisons, or refusing to cooperate at the risk of much longer terms in prison. (The same procedures will be established for government military officers accused of atrocities and those guilty of financing the paramilitary fighters who ravaged the countryside through the mid-2000s.) The FARC also agreed that guerrillas would begin handing in their weapons when the final accord is signed. Negotiators had previously agreed on rural development strategies, political participation, and counterdrug policies. Almost universally, the agreement has been hailed as an historic achievement. The announcement in Havana capped three years of talks facilitated by “guarantors” Cuba and Norway and later supported by the United States, represented by former Assistant Secretary of State Bernard Aronson. During a mass in Cuba several days earlier, Pope Francis had implored the two sides to strike a deal, noting that “we do not have the right to allow ourselves yet another failure on this path of peace and reconciliation.” U.S. Secretary of State Kerry called the Havana accord a “major breakthrough” and pledged that Aronson would stay closely engaged. Latin American peace accords – most ending wars much shorter than the five decades of Colombia’s – provide ample evidence that the road ahead, however historic, will not be without difficult challenges. The accord will require a constitutional amendment, and President Santos will have to submit it for congressional approval and a national referendum. Former President Uribe, who leads Centro Democrático, has already declared war on it, calling it “a coup against democracy” that will lead to a “new dictatorship backed by guns and explosives.” (Uribe also attacked Kerry’s statement as “deplorable.”) Public discussion of details of guerrilla abuses, including forced youth recruitment and sexual violence, will play into opponents’ hand. Colombian Prosecutor General Alejandro Ordóñez, an Uribe ally, said last week that any accord that does not entail prison terms for FARC commanders guilty of crimes would be “legally and politically untenable.” He claimed that it would violate victims’ rights and international law, which requires that punishment for war crimes be “proportional to the crimes committed.” Human Rights Watch also condemned the provision and predicted the International Criminal Court would do so as well. Fulfilling commitments in the agreement to address the longstanding lack of government infrastructure in huge expanses of the country, help even modestly the resettlement of the more than 5 million persons displaced by violence, and expand programs to alleviate poverty and income inequality will have price tag beyond Colombia’s current ability to pay. Informal estimates of the 10-year cost are $30 billion. The willingness of Colombian elites, who only grudgingly paid a war tax, to help foot the bill is far from certain. The FARC’s ability to enforce discipline among its rank and file is also untested. There are reports that some commanders oppose any agreement. Moreover, like demobilized paramilitary combatants, many combatants know no life other than rural combat and will be tempted to keep their weapons and join criminal networks that continue to terrorize rural communities. The outstanding U.S. warrants for the extradition on drug-trafficking charges of reportedly dozens of FARC commanders may require some finessing, but Colombia’s peace commissioner, Sergio Jaramillo, suggested confidence that Washington will not demand extraditions if, as is almost certain, they would be a deal-breaker. The peace talks in Havana between the Colombian government and the FARC guerrillas have continued to show slow but steady progress since President Juan Manuel Santos, who has staked considerable political capital on ending the 50-year conflict, began his second term three months ago. Two years of negotiations have produced preliminary agreements on agricultural development, political participation, and resolving the illicit drug trade. In August, negotiators turned their attention to compensating victims of the conflict, while a sub-commission staffed by top military figures from both sides has been developing recommendations for implementing a bilateral ceasefire and disarming combatants. A recent ruling by the Constitutional Court has paved the way for the government to hold a public referendum on the peace accords once a final agreement between the two sides has been reached. The challenges facing the successful negotiation and implementation of peace accords are significant. At home, former president Álvaro Uribe and his allies continue to harangue President Santos, accusing the government of showing too much leniency in negotiations and most recently denouncing the participation in Havana of the FARC commanders accused of human rights abuses as an affront to their victims. Santos clashed publicly with the Inspector General (procurador general) as well after the President secretly approved trips to Cuba by the FARC’s leader, “Timochenko.” For its part, the FARC has expressed reservations over immediate disarmament, still haunted by the deaths of thousands of members of its mid-1980s political party. Also at issue is the fate of those guerrilla leaders who face active arrest warrants or have been tried in absentia for humans right abuses; the FARC has adamantly resisted the possibility of jail time for its members. The government is also concerned that 10-20 percent of the FARC members will shift loyalties to organized criminal gangs after the war ends. Severing ties between drug trafficking and the FARC supporters will require, among other things, a serious commitment to rural development to foster social inclusion for farmers who rely on coca plants for their livelihood. In spite of these challenges, both sides have displayed a serious commitment to negotiating an end to decades of war. The FARC has used past ceasefires to rebuild and organize its military strength, hence the government’s delay this time in negotiating an end to hostilities. But attacks on infrastructure and security services are down from 2013, and members of the FARC have by and large respected several self-imposed ceasefires announced by the central command, most recently during this summer’s elections. Santos has gone out on a limb by allowing wanted criminals to travel to the negotiations, but that decision is consistent with other policies. When war crimes victims were invited to tell their stories to negotiators, Santos brushed outside critics and ensured that victims of the FARC, state, and paramilitaries were all equally represented. Public support for the peace process looked shaky in September but has rebounded, as new polls from Gallup released last week shows over 60 percent of Colombians favor talks. The government public release in early October of the preliminary agreements appears to have helped, silence critics who accused the government of selling out to guerrilla demands behind closed doors. There is still considerable work to do in reaching an agreement, selling it to the public, then putting it into practice, and public support may waver if the process drags on into next year. 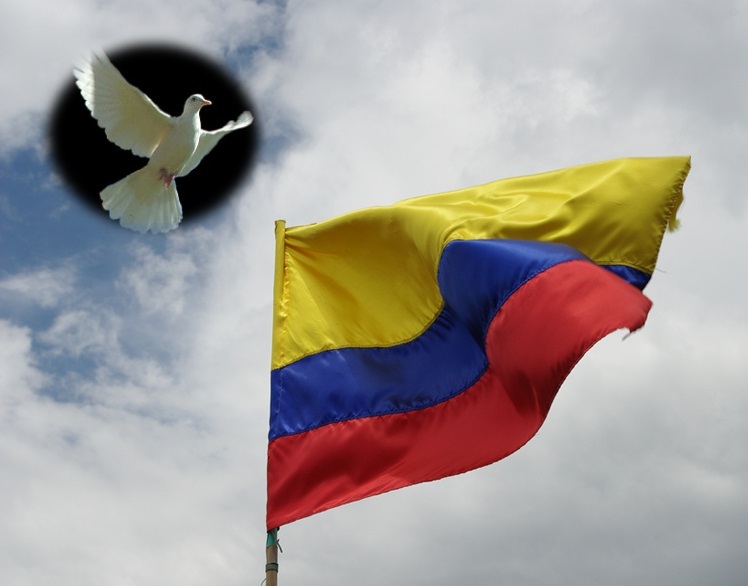 But, the environment has never looked as favorable for peace in Colombia as it does today. Santos has stated that the time is right to start talks, although he has emphasized that the government “will not make any concessions on the military side” and that military operations “will continue with the same intensity.” Observers note the conditions are indeed different from when previous efforts foundered. The FARC leadership has been weakened considerably, and the group’s ideological grounding and foreign support have evaporated. The FARC apparently feels that the security of demobilized combatants – a longtime concern – will not be compromised even though demobilized paramilitaries could very well try to hunt them down. Timochenko said the FARC “come[s] to the table without grudges or arrogance,” and the group issued a “Video for Peace” with a rap song urging support for talks – signs of confidence in the process not seen previously. The State Department’s statement welcoming the talks was positive but general. Santos’s decision puts Washington on the spot – of which the sniping reflected in Chairwoman Ros-Lehtinen’s remarks is just one part. Sitting on a massive U.S. investment in the military option and espousing similar programs against narcotics traffickers in Central America, the Obama Administration may be reluctant to go significantly beyond rhetorical support for the talks. Cuba and Venezuela, whose influence over the independent-minded FARC has often been tenuous, are a moderating force, but Washington may be loath to acknowledge their value in a peace process. Santos has little choice but to take the FARC’s sincerity at face value for now, but he surrenders little leverage in the current configuration. The FARC may be cynically calculating that it can benefit from the sort of demobilization that the rightwing paramilitaries had – reaping benefits for commanders and troops, and then re-mobilizing as a newly configured force. After all, the bandas criminales – BACRIMs – marauding through parts of rural Colombia today are essentially paramilitaries without the ideological and political overlay of the past. 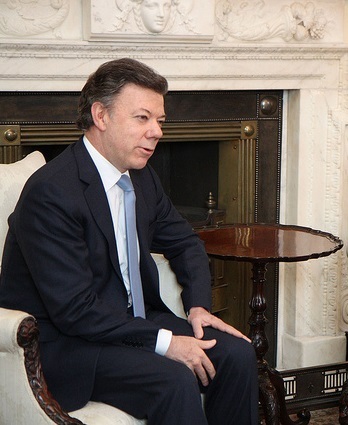 Whereas the truce between former President Uribe and the paramilitaries had support from the Bush administration, it will be telling to see whether the Obama administration accepts what’s needed for a serious peace effort with the FARC, such as an expensive demobilization plan, launched by a Colombian president with stronger democratic credentials. NOTE: This is a corrected version of an article originally posted on September 7, which incorrectly characterized the State Department’s position on the talks. We regret any confusion the inaccuracy may have caused.